What is Art Theft and why is it so serious? ...To find out more please skip to the end of this page! What are those images above our names? Those are "poses" or "avatars" - your image that is used to represent you. We want everyone to express themselves as much as possible, so we encourage everyone to be creative, unique, and be yourself. That's why we allow you to upload your own poses. However, there are rules and guidelines you need to abide by when uploading your pose. I want a pose of my own! How? To obtain a pose, you can do 1 of 4 things. You may create your own, pay someone else to make you one(called "Customs"), buy a pose someone is selling(called "Premades"), or use a free pose that someone else has labeled as free for all(called "Freebies"). Once you have your pose, you upload it. (check the pose uploading tutorial for help). Once you've properly uploaded your pose, sit back and relax. The Art Review Team checks poses constantly, and chances are your pose will be reviewed within a day or two, if not within hours. However, poses can be held up to about a week if it is under discussion. With these, links need to be provided directly to the page showing the image where permissions is stated. Please do not directly link to the image if possible. Any other links on Photobucket, Google, Flickr, or other type of site will not be acceptable, unless it can be confirmed by the ART. Please be aware that if you continue to submit artwork for review with unacceptable links or information repeatedly, you will receive a warning notice from ART. This will similarly explain everything stated here. After this notice, if you continue to do this, you will receive a short ban for harassment of ART. So, please be kind and form good habits! As by providing the correct information when uploading an image, you are helping the process along and helping everyone out. And ART will greatly appreciate it! When uploading your own artwork! + But I don't have a forum account! - WHAT?!?! Well, just sign up! It's easy and free! Just give the Forum Admins some time to approve, and you'll be ready in no time! + But the artist doesn't have time to transfer, and they like their artwork to be kept private. Would a screenshot of the PM containing the pose work? Only .GIF and .PNG poses are acceptable. Currently we do not accept animated .GIFs. The maximum file size is 150 KB (153,600 bytes). The background must be transparent, or "see-through/invisible". To do this it must be a different color from any color within the pose itself. Some programs will allow you to set the transparency, and others will delete colors entirely. If you upload a pose with an opaque background, or if any of the colors within the pose are also transparent, it will not be acceptable. All poses(excluding AFK poses) must always be mirrored. By this we mean, you upload a left facing pose and a right facing pose. You simply have to flip the image - it does not need to be redrawn. This allows you to "Turn Around" in-chat. Poses with loose pixels(pixels outside of the pose) will not be accepted. Even 1 loose pixel is enough to have a pose rejected. In some cases, loose pixels may go along with the pose(fleas, shadow, fading effect, smoke effect, pose noticing loose pixels, etc.). Then and then only are they acceptable. Adult or overly suggestive poses are not accepted on Fox Paradise. All poses must be within a certain size limit. These limits are both physical pixel limits as well as more subjective limits which take into consideration the avatar species and how the avatar is posed. If an avatar is too large or too small, it will look bad in the chat. Poses must be at least 25 pixels in height and width. They can't be more than 600 pixels in height or in width. PLEASE NOTE that images for most creatures (wolves, tigers, bears, etc) would be considerably smaller than the 600 pixel limit, and they would probably be less than 350 pixels in height / width. As mentioned previously, avatar sizes are somewhat subjective. For example, different types of canines will vary in size - a dire wolf is much larger than a fennec fox. Also, though your pose is within the max size height, it may be proportionally too big. Make sure your pose isn't too bulky and certain areas aren't too large! The MAXIMUM pixel size is 600 by 600 but most critters will be about half of that (at most 300 pixels in height or widthg). The MINIMUM pixel size is 25 by 25 and should be used for teensy things like bugs, pixies, etc. All poses are required to have some form of shading. The purpose it to give the appearance of weight and depth. You must have at least one layer of shading (darkened areas). Highlights are not required, but highly encouraged to keep your pose from looking flat. Shading must coincide with where the light would and would not shine. Randomly placing shadows on your pose, without regard to where the light is coming from will not be accepted. If you put thought into where the light would and would not hit, you should have very little problems with your poses being accepted. Poses are allowed to be solid color. They do not have to have additional colors, because your character may happen to be all white. You are allowed to have markings from different animals. Markings should flow with the anatomy of your pose and not appear "blocked" on. All poses must have a solid, dark, natural outline. It is generally recommended that the outline is either black, very dark grey, or a dark shade color of the pose it's around. Lighter outlines are not preferred as they tend to appear to have a halo effect. The outline is too light in places and looks like " loose pixels". Color of outline doesn't match pose at all. Everyone has their own drawing style. This is perfectly understandable. However, keep in mind that there are set anatomy and physical limitations. That being true, your style may be unacceptable at times, and need to be adjusted to comply with our standards. Anything offensive will not be accepted. This includes obscene jestures, hate symbols, and the like. A small amount of blood is acceptable. Any sort of wounds that appear self-inflicted are not acceptable. Zombie poses are acceptable but may not have too much gore in them. If you are unsure whether a pose is too gorey contact a member of the ART. We judge poses containing blood/gore on a case-by-case basis. We strongly encourage proper anatomy. There are several good tutorials on our forum, as well as other sites, such as DeviantArt. While it doesn't have to be perfect, please realize that the better the anatomy, the easier it will be to determine the species. 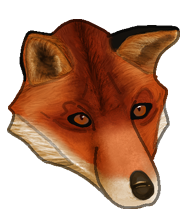 We allow many species on Fox Paradise, but most are restricted to private rooms. If we can't tell what species it is supposed to be, it will be rejected or placed into a category that seems most fitting. All poses must appear 80% of an acceptable species. Usually up to 2 major mods are acceptable. If it's an extreme mod, where it is hard to determine if there is still any remaining acceptable species in the pose, it usually isn't acceptable. 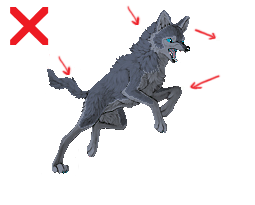 Some mods do not go over well and are unacceptable, such as taurs, wolves with beaks, etc.. Most props are acceptable. Weapons are allowed as long as they aren't held in a threatening manner, except on Howloween. You are allowed to either be a plushie, or have plushies in your poses. Plushes must be clearly inanimate or they will be rejected. The easiest way to achieve this is adding stitches. There is no limit on the number of plushies allowed in a pose. These just happen to be the most common reasons - other reasons will be dealt with and discussed on a case-by-case basis. Mounts are acceptable, but try not to go overboard. The creature must be being ridden or otherwise clearly look like a mount. Acceptable mounts would be horses, small dragons, etc.. If it's a small pet, there is no limit to how many you can have in a pose. Larger pets should be limited to 2 per character. Pets cannot be the same species as other characters in the pose, e.g. if you have a pose of a horse with a foal, the horse or foal (or both) should be a plushie. Gag poses, or "joke poses", are poses that are meant to be drawn with simplicity or poor aesthetic quality. Gag and Mini poses require little shading, aesthetic quality, highlighting, or anatomy. All other standards still apply. We are extremely lenient with AFK (away) poses. You may have any quality pose. You may have just a wolf head, a feather, a sillouette, a computer, anything. The main requirement is the letters "AFK" must be written somewhere around your pose, so that it doesn't appear that you have a pose that'd normally be unacceptable. Clipart is usable if appropriate sources are provided. Modding is only allowed if the original artist says so. The ART's job is to review uploaded poses and rooms. They've been trained to accept or reject submitted art based on the set guidelines, and protect against art-theft. Like any other administrators, all of the ART are real people, and deserve your respect and patience. Art theft is when you take a piece of art work, drawing or photo, and claim / use it as your own personal work when you are not the true owner. By uploading a pose, room or other artwork, you are taking responsibility for it and you will be banned if you use copyrighted art without permission. This is very important: you need permission to use other people's artwork. Taking someone's art and modifying a couple things on it is still theft. You are allowed to use references as long as you do not trace it. No one can copyright a position, but if your pose outline matches up exactly to a photo or artwork you will be banned. Some people sell poses, and if you try to use one without paying for it, that is also art theft. 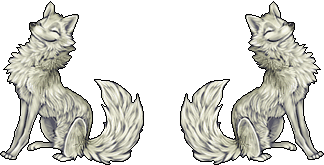 You cannot upload copyrighted characters (like Digimon� adoptables) but you can dress up your wolf in a Digimon� costume. You cannot use found clipart or images from Google. Art theft can be many things, so please clear all up questions ahead of time with the ART, rather than risk the consequences. Even if you do contact the ART before uploading, make sure you still fill out the permission explanation box to ensure a quick review. We take art theft so seriously, it has special series of consequences. For your very first offense of confirmed art theft, you are given a warning. Your next offense results in a three day ban. The third offense is a two week ban, and then any subsequent offense is a permanent ban. Questions? Ask the ART via forums or email. You may also decide to contact them personally via forum PM, chat messaging system, or in the chat. But please note that the ART are people too, and they deserve respect. Do not harass the ART. Thank you! Images are � 2008-2011 by their respective owners.